We love it when friends recommend us and were delighted when Roxanne’s mum contacted us about Roxanne and Ray’s wedding at Penshurst Place. I had Rachel from Veiled Productions with us for the whole day starting from us getting ready she was amazing very discreet and so polite captured every moment needed, when we received our wedding video we also got some photos and a little gift I couldn’t be happier with it every thing I asked for and more was in our video it was beautiful, she was amazing to have and easy to work with I would highly recommend this company. Roxanne and Ray’s wedding day was filled with so much love. We were so thrilled to be able to capture it for them. Their gorgeous daughters will now be able to watch it back when they are older – experience the day again. It’s one of the most beautiful estates in Kent! The rooms for the ceremony and reception were unique and steeped in history. Although extremely old, the rooms had a lot of natural light which really helped for gorgeous footage. The grand windows at the front of the ceremony room made for real wow-factor when the guests walked in. These windows were perfect for getting a photo of everyone from high up too – something we really value from a wedding venue. 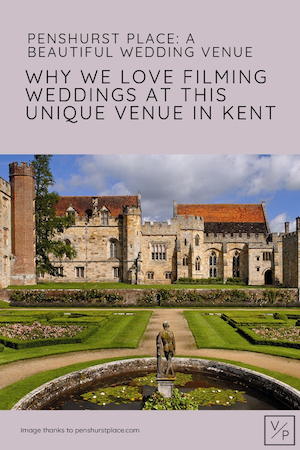 Getting married at Penshurst Place and looking for a wedding videographer? Contact me below, I’d love to capture your special day.